Family crisis? Same old situation every family gathering? Family is a concept we cannot escape. We all have one, or at least came from one, and each of us has a story about it, even if that story goes: “I don’t want to have anything to do with my family”. This statement suggests that there is a powerful story which encapsulates years of events that have led up to this point. No matter what has happened, within them, families affect who we are. Being part of the organism which we define as ‘my family’, we must adjust and find a way to exist within its boundaries, or at least until we are able to break away and meet our own needs independently. Often being in this ‘state of existence’ happens at a cost of ‘not being able to be myself’. This is the price of keeping the family system functioning. ‘I want to belong and be loved’ and ‘I want to be free and breathe’? In my work with a family crisis I suggest to my clients, looking at their families and themselves as ‘systems’, where all members of the family system are interdependent elements. We depend on each other to maintain it, and expect of the others to fulfil their roles, i.e. behave in a certain way. However, because of the interdependence, it takes the change of only one element to affect the whole system. When one family member changes, the others have to adjust their behaviour accordingly, otherwise the system may collapse. A teenage girl with anorexia is struggling with her own illness, and not able to see the impact on the others. The worried mother will focus attention on her excessively – on one hand abandoning other siblings by not having time to tend to their needs, but on the other hand obsessing about food for the whole family and “feeding them” with her anxiety that they may not be eating enough. in fact replaying the parents’ behaviour. Although each of the individuals have good intentions and tries to ‘fix the problem’, their lack of overview and skills to communicate with each other causes the divide and crisis to deepen, threatening the integrity of the system for example, dad may decide to leave the family system or perhaps one of the children may develop their own behavioural problems, etc. Family relationship therapy – how does it work? The goal of Family relationship therapy is bringing the awareness and skills of systemic thinking into the family environment. 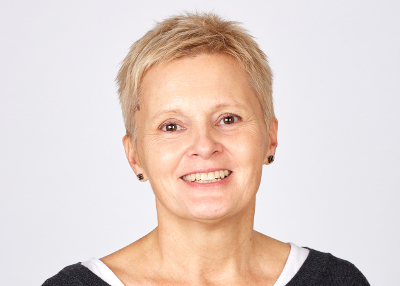 Each of the family members need to understand their role and impact not only in their own right – ‘who I am?’, but in context of others ‘what is my impact on others, and how do they impact on me’. With such a foundation we can then look at learning to communicate and behave in such a way that the needs of both, an individual family member and of the ‘family system’ are being looked after. In a way we see the family as complicated machinery which may be in-need of ‘retuning’ or ‘recalibrating’. Therapy works even if only some of the family members engage in therapy, because the change in one of the elements will eventually put in motion changes in other elements (family members). Everyone is affected, everyone needs support. The mechanics and impact of traumatic events on the family and their members can be seen on the example of the addiction of one of the family members. The Squares and Blob model below suggests a way of looking at families as “systems”, where all members of the family system are interdependent elements. We depend on each other in maintaining it, and expect for the others to fulfill their roles, i.e behave in a certain way. However, because of the interdependence, it takes the change of only one element to affect the whole system. When one family member changes, the others have to adjust their behaviour accordingly, otherwise the system may collapse. 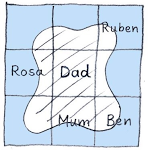 The large Square above represents the family ‘system’. 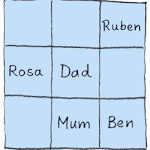 Nine Squares represent family members (the number only matters for clarity of illustration; it is not essential to find family members for each Square). their own space (little Square) where they can thrive and develop – physically, intellectually, emotionally. The Blob above represents addiction, which seeps into, and takes over the Squares of other members, who are torn apart from each other. 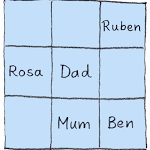 the large family Square (like Ben) or pushed out of it if they can’t, or don’t want to fit in (like Ruben). The case study below uses the example of a fictional family to explain how the process happens and how to change its effects. The Square below represents a family – the characters are fictional, although each of them carries bits of stories of people I worked with. especially to Dad who was a musician himself, and is very proud of Ben. beginning but he eventually got to trust that the new family is for good. didn’t have to work and enjoyed running a family home, like her mum. Dad (age 45) is an estate agent with many years of experience in UK and abroad. something ‘big’ happens. It can be a serious illness or in this case addiction. drinking ‘spills over’ to become a Blob. because he can still keep the job and provide for them. hardly any ‘space’ left for living their lives. • Will Mum be okay left alone with Dad? If we bring friends home after school will Dad embarrass us again? • Why is he so angry and irritable all the time? I am scared; I don’t know what is going on with the money, yet he doesn’t want to talk to me or gets angry when I mention his drinking; I feel powerless and fed up with lying and covering up for him with work and friends. I hate being here, I hate Dad for letting me down again; I pray for days to pass until I go to Santa Lucia, meanwhile I stay away, stick to my friends, hope they won’t find out about Dad. I feel sorry for the little ones, but I have to think of myself. I feel I must help Mum, she seems really upset and tired. Maybe I will look after Ben and Dad. Ruben stopped taking me to swimming, he is hardly at home. I could read more, but I worry when Mum and Dad argue so I prefer to stay with Ben and make sure he is okay. He always wants to be in the middle of things. I know something is wrong – what used to make people laugh and hug me, now is upsetting them, or they don’t notice me; maybe they don’t love me anymore? Maybe I should try harder to be funny? Whenever Dad is back I try to get him to play with me and make him laugh, but it is very hard now, because he is always angry. different ways. 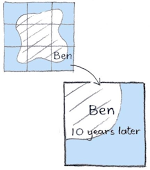 They have become ‘Squashed Squares’ (Diagram 2) – a metaphor for different coping strategies to fit into the new situation. family is okay, and that her needs are not important. When Mum has to go to work to make ends meet, she takes over a lot of house chores and looks after Ben. The task of being a parent and carer is very difficult for a young girl and she constantly feels not good enough, especially that her school results are getting worse. understand and becomes increasingly angry and disappointed with the world. matter what he does he will not be loved or noticed, and people are not to be trusted. care about others. Although it is painful to be alone, it is better than being hurt. He is angry with his parents for ruining his life. easily take upon themselves to be responsible for Ben’s anger and unhappiness. to look for comfort in substances and repeat the pattern of his dad. He was himself a victim of his father’s Blob, trying to live within his own ‘Squashed Square’. Like Rosa, he was a ‘carer’, helping his mum to raise the family. When we look at the S&B model as if it is a map of a territory where the Blob represents the area of conflict, we will see it as an illustration of “what happened” rather than “who did what to whom”. We can see that addiction “happened” to this family and that everyone is affected. responsible father, desperate not be like his dad. as the using stops things will be ‘as before’. 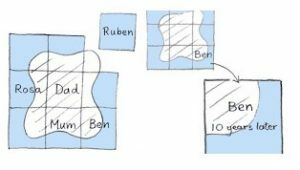 The map shows that the ‘Squashed Square’ happens without our conscious choice, and that it is likely to stay even if we are out of the family dynamics. abusive behaviour in his marriage and he has alcohol problems himself. In order to repair the damages it is not useful to blame or punish, as it causes resentment. perpetrators, and see only the casualties in need of help to move on. The model and the case study demonstrate how patterns can repeat from generation to generation. 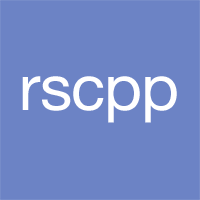 unhelpful coping patterns and in effect, addiction. For all family members it is a relief to understand that the strategies and behaviours they adopt are not wrong, or stupid, they were just the best they could find at the time. Once they understand where the problem lies they can start to work to regain their Square Shape, just like the pillow made from intelligent foam will, if shaken around a bit. They can stop the cycle.